We’re in the last days of our trip here in the Yucatán! After our stay in Valladolid, we made our way to Río Lagartos, a coastal city on the Gulf of Mexico. Río Lagartos has a very important ecosystem: the mangrove. The are different variations of mangrove present here, including black, white, and the most common, red. The red mangroves off the coast of Río Largartos. It is called the red mangroves because it makes the surrounding water red too! Regardless of their color, they perform several crucial ecological functions. They act as a natural barrier for storm surge coastal flooding during hurricanes and other strong storms. They are a nursery habitat for lots of species from crocodiles to raccoons to birds. Finally, they provide nutrients for the fish in the water as they drop leaves to expel excess salts. Unfortunately, these mangroves are being removed to make room for settlements and developments on the coast. 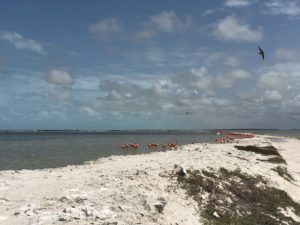 Thousands of acres of mangroves have been removed on the coasts of Mexico, especially along the Caribbean Sea in cities like Cancún and Playa Del Carmen to build resorts and homes. The effects of the removal of these mangroves have been evident in recent years. With more intense and frequent tropical storms, the coastal cities of Mexico have experienced severe flooding. 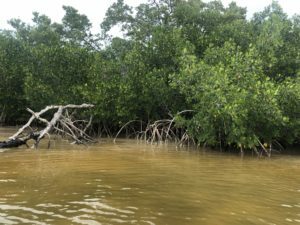 Luckily, the mangroves of Río Lagartos were established as a UNESCO Biosphere Reserve in 2004 and will persist on the northern coast of the Yucatán without threat of removal for development. On our boat ride through the mangroves, we spotted lots of pelicans, willets, white egrets, great blue herons, black hawks, ospreys, cormorants, and a roseate spoonbill. 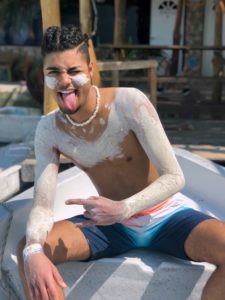 Our boat ride took us all the out to a desolate beach where we saw hundreds of flamingos in their natural habitat, squawking like geese and burying their heads in the sand as they looked for shrimp to eat. There were so many, the clouds above acquired a rosy hue! It was a truly amazing sight. Flamingos in their natural habitat! 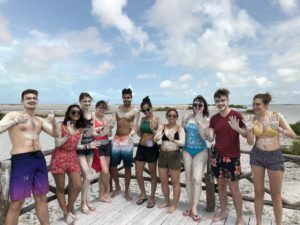 Before going back, we put white mud on our bodies, a ritual done by many Mayans for the mud’s healing and protecting properties. After arriving back to Río Lagartos. Time to wash it off! The next day, we visited an elementary school in Sisbichen. 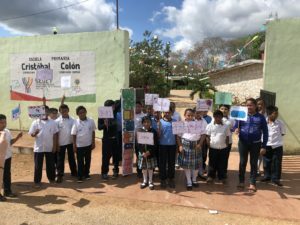 This school, Cristóbal Colón, is very special: it is one of the few elementary schools that teach both Mayan and Spanish. 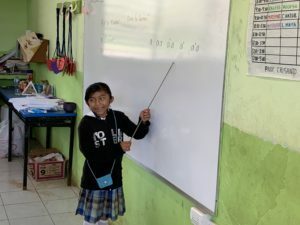 The students learn how to speak and write Mayan glyphs and learn about the history and culture of their ancestors. 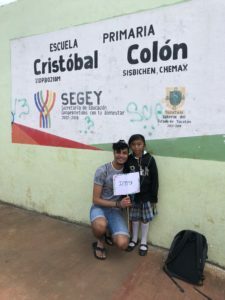 It is very important for students to preserve their culture; I hope Cristóbal Colón serves as a model for other schools in Mexico. When we arrived, the students were already waiting for us outside. Each of the students decorated a sign with our individual names on it. The students of Cristóbal Colón eagerly awaiting our arrival! I was paired with Lupita Petudzul, a 10-year old fifth-grader. When I asked her what her favorite part of school was, she answered “Salir a jugar!” which means to go outside and play. Her favorite sport is basketball and she likes all subjects equally. Lupita is very smart: she recently placed second in a regional Mayan-speaking contest and will be going on to the state contest shortly. Bix a K’aaba’ – What’s your name? In K’aaba’e’ Jeremy – My name is Jeremy. Ma’alob – Better than good. Yaan a yaaj – Do you have a girlfriend/boyfriend? Mina’an – No, I don’t. Lupita taught us the five different ways to pronounce Mayan vowels and how just an accent can change the meaning of a word completely. For example, “Kan” means four, “Kaan” means serpent, “Ka’an” means sky, and “K’an” means yellow! Lupita teaching us the different ways of pronouncing Mayan vowels. We also learned how Mayans did mathematics using only 3 symbols, a dot (1), a dash (5), and a snail (0). The fact that the Mayans were able to understand the concept of zero is remarkable! After our Mayan lessons, we played a game of fútbol (soccer). Lupita and my team won! Before leaving, we gave the students our gifts of coloring books, crayons, pencils, and other school supplies. Elaine and I playing a card game we brought with the students! 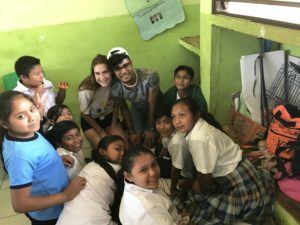 The importance of keeping the Mayan culture and traditions alive by teaching the youth. I hope you all will realize how important these are too! Sad to hear about the acres of mangrove forest that have been removed. Man often sacrifices nature for financial gain. Thankfully, this reserve was established 🙌🏼 Nice pic of the beautiful flamingos. I know they don’t let you get too close to them. Wonderful of the Rutgers dean to arrange for your group to meet with these school children…great learning interaction….we can always learn from one another, no matter what age! Wow, learning Mayan from sweet Lupita 💕 It’s good that they are keeping their culture alive. Glad they took you to a school.